chewing tobacco, which comes in the form of loose leaf, plug, or twist. The most common, loose leaf, is usually packaged in foil pouches. Chewing tobacco is placed between the cheek and gums. snuff is finely ground tobacco that can be dry, moist, or packaged in pouches or packets. Some types of snuff are sniffed or inhaled into the nose; other types are placed in the mouth. Moist snuff, the most common, is often called dip. It’s placed between the cheek or lip and gums; it requires spitting. Snus is a newer form of moist snuff used in the United States. dissolvables are finely ground tobacco pressed into shapes such as tablets, sticks, or strips. These products slowly dissolve in the mouth. They come in the form of lozenges, orbs, sticks, and strips. Smokeless tobacco is not safe and can lead to nicotine addiction. Many smokeless tobacco products contain cancer-causing chemicals. Smokeless tobacco can cause cancer of the mouth, esophagus, and pancreas. Smokeless tobacco can cause gum disease, tooth decay, and tooth loss. 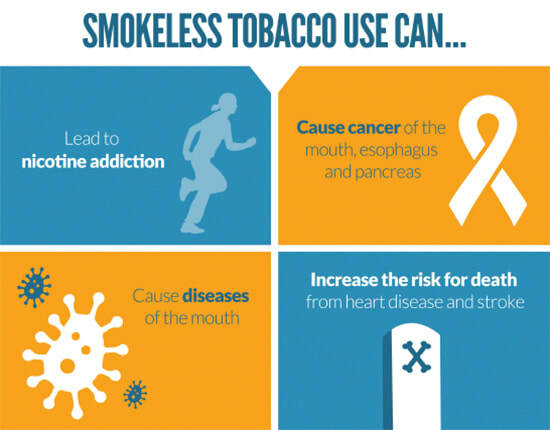 Smokeless tobacco products can also increase the risk of death from heart disease and stroke. Many smokeless tobacco products come in flavors and packaging that appeal to young people. Candy and fruit flavors mask the bad taste of tobacco, making it easier for youth and teens to start using tobacco. With a new range of products and flavors on the market, there are more opportunities for young people to experiment with tobacco. Adolescent smokeless tobacco users are more likely than nonusers to become adult cigarette smokers. YMajor U.S. cigarette companies, including R.J. Reynolds and Altria, have acquired smokeless tobacco brands. The marketing of smokeless tobacco products has also significantly increased. In 2013, tobacco companies spent more than $503 million on advertising and promotion of smokeless tobacco products– that’s more than double what was spent 10 years earlier in 2003.Much of this spending was used to pay for price cuts through coupons, sales, and giveaways. Even without price cuts, many smokeless products cost less than conventional cigarettes, appealing both to young people and low-income communities. The difference in smokeless tobacco use among rural and non-rural populations in Florida is sizable. While only 2.4 percent of non-rural Floridian adults use smokeless tobacco, 6.3 percent of rural adults use these products – an astounding increase of 162.5 percent. This disparity is mirrored in youth use as well. While 3.1 percent of non-rural youth (ages 11-17) use smokeless tobacco, 7.4 percent of rural youth use the products (a 138.7 percent increase). The widespread use of smokeless tobacco in baseball also helps to promote a product that can lead to nicotine addiction and causes cancer, as well as other health problems. Given this terrible example, it’s no surprise that too many kids are using smokeless tobacco. The latest surveys show that 14.7 percent of high school boys (and 8.8 percent of all high school students) reported current use of smokeless tobacco products. You can talk to your local officials to let them know you are concerned about the tobacco industry’s marketing tactics that target children and other vulnerable populations. Working together, you may be able to influence decision-makers to take action. You can also help encourage local venues and events, including local athletic fields and sports leagues, to go 100% tobacco free – not just smoke free.